New Wrangler features for 2011 include new sound insulation and a removable hard top that matches body color. EDITOR'S NOTE: This story originally had the wrong name for the new V-6 engine that the Wrangler will get next year. It is the Pentastar V-6, not Phoenix V-6. DETROIT -- When it comes to the Wrangler, Jeep's go-anywhere vehicle, customers care about its ability to climb rocks or barrel through streams. Interiors? They probably are below the top 20 on a list of priorities of passionate "Wranglerheads," says David Kelleher, a Philadelphia Jeep dealer. They expect their interiors to be "utilitarian," he says. But those customers will still find much to like about the 2011 Wrangler's redesigned, more upscale interior, Kelleher says. The new interior will feature a redesigned instrument panel and center stack, new storage areas and softer surfaces. The vehicle gets new steering wheel-mounted controls that make it easier to operate the radio, cruise control and hands-free phone. Other new features include new sound insulation and a removable hard top that matches the color of the body, available on the Wrangler and Wrangler Unlimited Sahara models. 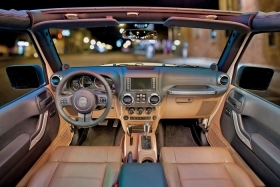 "I don't think anybody's going to say, 'That interior is too nice for the Wrangler,' " says Kelleher, owner of David Dodge-Chrysler-Jeep in Glen Mills, Pa. He says the improvements will make the Wrangler more attractive to a new group of customers. "There's a whole new generation of people who think it's cool to drive a Wrangler," he says. These "urban cowboys" may look more closely at the quality of the interior, he says. This is the first of two upgrades the Wrangler will get, according to the five-year product plan that Chrysler Group released last November. The Wrangler will get Chrysler's new Pentastar V-6 engine next year along with a new transmission. Chrysler Group is giving similar interior upgrades to other vehicles, including the Jeep Grand Cherokee and Ram pickup. The Wrangler has been a bright spot in Chrysler's stable. So far this year, Wrangler sales are up 5 percent, to to 56,192, through July. Production of the 2011 Wrangler began last week at Chrysler's Toledo Supplier Park plant in Ohio.